Modelling sugar cane railways, shire tramlines, and other small industrial lines is a niche interest, regardless of scale or gauge. This means that there are a limited number of commercially available models and detailed information on a specific wagon, locomotive or locale is often unavailable. If you model cane trains in Florida or Louisiana you can mostly use stock locomotives and wagons (freight cars) as their cane is generally carried on common carrier railway lines. American and English/European steam locomotives were common in many sugar producing countries, but otherwise there are very few ready-to-run (r-t-r) models or kits... thus most modellers will have to do at least some kitbashing and scratchbuilding. The CaneSIG Handbook articles are a good starting place, and the article on scale/gauge choice should be an early read. You also need to explore other sections of this web site to help you better understand the sugar cane railway industry and to choose a specific prototype. Overall you'll find several thousand photographs (image collection), plans and modelling tips. View the alphabetical listing of modelling resources for direct access to the site's modelling information, look at what other modeller's have created (N-O scales - Large/Garden scales), and check out the prototype industry itself. Welcome aboard and best wishes! Modelling what country/mill at what time in history? Permanent layout, Modular, Exhibition, Diorama/Display, Virtual? Remembering that a fixed decision on one of these items may negate possible choices on other questions. For example, being unwilling to scratchbuild models pretty well eliminates many countries/mills/locos/etc., as commercial models are not available. Sugar cane railways are typically 'narrow gauge', in that they often run on tracks that are laid closer together than the 'standard gauge' of the mainline freight and passenger trains. Cane trains in Queensland, for example, have a gauge of 610mm (2') while the mainline Queensland Rail runs on 1067mm (3' 6"). New South Wales, on the other hand, has a mainline gauge of 1435mm (4' 8.5"). And some cane has been/is carried by the mainline railways, even in countries where most is carried on narrow gauge lines. Gauge choice for the prototype railways was, and still is, a matter of economics and politics but a narrow gauge typically permitted tighter corners, faster construction and lower construction costs than its standard gauge cousins. Originally designated as 'tramways' in Queensland, the smaller gauge allowed them to operate on the side of shire roadways and through farmer's fields. There are a few suppliers of locomotives and rolling stock (r-t-r and kits) suitable for modelling cane railways in HOn30/009 (using 9mm gauge track), On30/O-16.5 (using 16.5 mm track), On24/On2 (using correct gauge track), and various garden scale/gauge combinations. 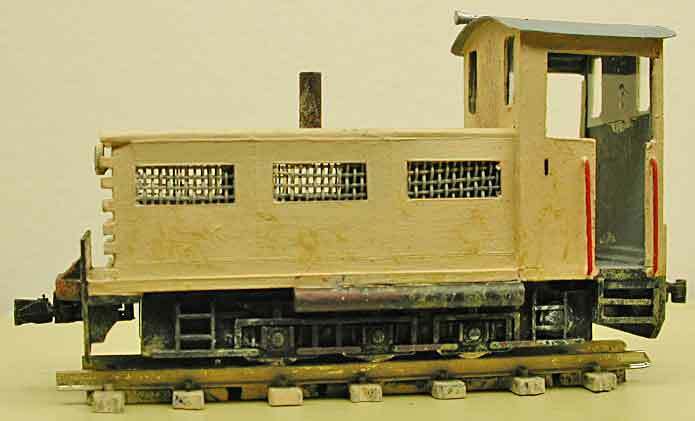 Ultimately, however, you'll likely need to adapt (kitbash) or scratch build many of the unique items required to build and scenic an operating cane railway. One of the first questions a novice modeller needs to answer is whether to model a specific prototype -- a specific mill in a particular country at a point in time -- or to 'freelance'. The prototype modeller will use information about the chosen prototype to make as exact a modelling scene as is possible within the constraints of modelling (selective compression, etc.). Locomotives, rolling stock, structures, scenery, other details and operating procedures will all be selected because they were present on the prototype at the chosen time. The freelance modeller, on the other hand, uses similar information to create a scene that is representative of the industry/era. Locomotives, rolling stock, structures, scenery, other details and operating procedures will be typical of the time and place but may include, for example, models from more than one mill if they contribute to the representation. -- The Jenbach locomotive (image below) is based on a particular locomotive and has been painted as it was in operation. -- The Comeng inspired 4wDM locomotive (image below) is also based on a specific prototype, but was adapted to fit a particular commercial chassis and mechanism, so has a different underbody. Through an error in modelling measurement, the cab is also a scale foot shorter than it should be, further changing the appearance from the original. -- The Fijian navvy wagon (image also below), on the other hand, was inspired by a couple of photographs of a particular Fijian wagon. Although it looks similar, it's shorter, in better repair and likely better engineered. The term 'kitbashing' refers to the process of modifying a commercial model kit to become a different model. This can be as simple as changing the roofing material on a structure to resemble corrugated iron instead of shingles, or as complex as modifying a locomotive kit to represent a model from a totally different era or different wheel arrangement. Structures are perhaps the easiest models to modify: replace distinctively European or American trim elements on a shop or factory kit with appropriate Australian practice and you'll have a model suitable for Queensland's tropics. Some of my most successful kitbashes involved replacing the enclosed steel cab on inexpensive r-t-r or kit locomotives to create 'plantation' locomotives. The new cabs were fabricated with sheet styrene. Kitbashing the HOn30 locomotive (above right) from a white metal kit is documented in #9 in the Handbook series. The On30 locomotive (right) is a simple conversion of a Bachmann r-t-r Porter model. Scratchbuilding is usually more complex as it involves creating a model using basic tools and materials: printed card, scale lumber, sheets of brass or styrene, etc. Scratchbuilt models can a reasonable or an exact representation of the original artefact. For example, I model a fictitious sugar mill and its equipment, thus my models need to look correct but are not necessarily absolutely correct for any mill. Other modellers, however, model a particular mill and must create quite accurate representations. The model (right) uses a 'N' scale Bachmann mechanism as the basis for a HOn30 model of a Jenbach diesel mechanical locomotive. 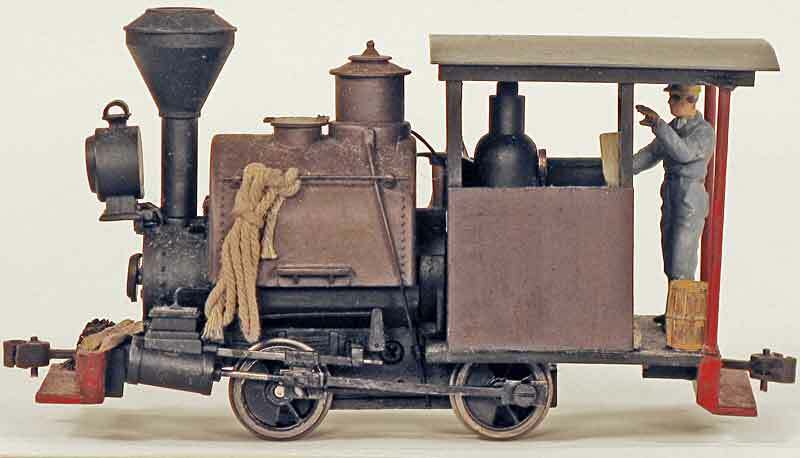 While only two locomotives of this type have been used in the Queensland cane fields they were modified extensively over the years, so this model represents the locomotive at one point in its history. Its construction, based on a Modelling the Railways of Queensland Convention presentation by Bob Dow, was described in the Handbook series #8. 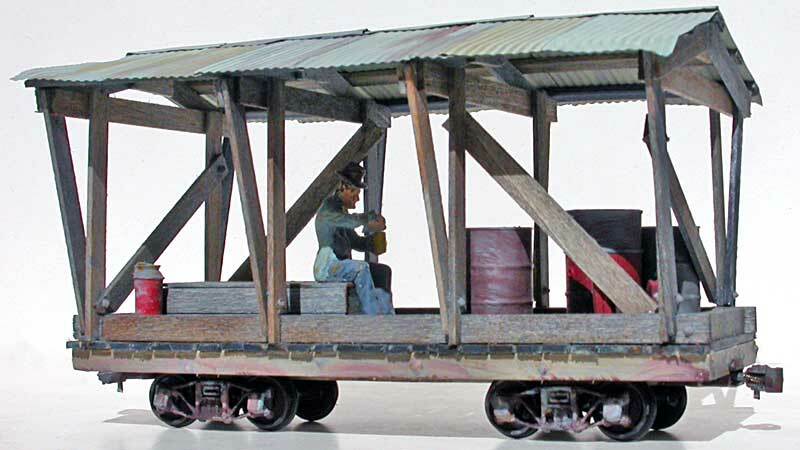 HO wholestick cane trucks can easily be built using a N or HOe scale wagon chassis (see Handbook articles #10 and #23). Back in 1997 Bob Dow also had an article in Australian Model Railway Magazine describing how to scratchbuild cane bins (pdf file). On30 models are roughly twice the size of HOn30 models and run on 16.5 mm track, thus can use HO mechanisms, etc. They are easier to see for both modellers and viewers alike (I've had some complaints about the small size of my HOn30 museum dioramas, particularly when they are located in a glass cabinet). 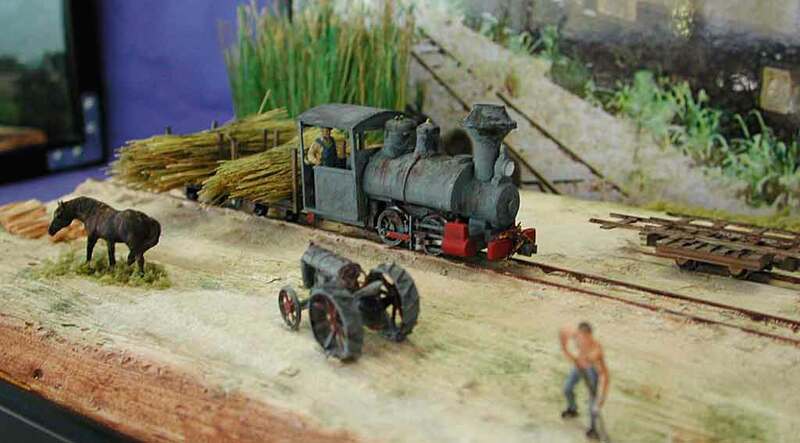 This model was inspired by a Queensland sugar cane loco and has a scratchbuilt superstructure on a commercial chassis(half of a Bachmann HO locomotive chassis). Its construction is documented in Handbook #15. Even totally scratchbuilt models often use trucks, couplers, and other components. 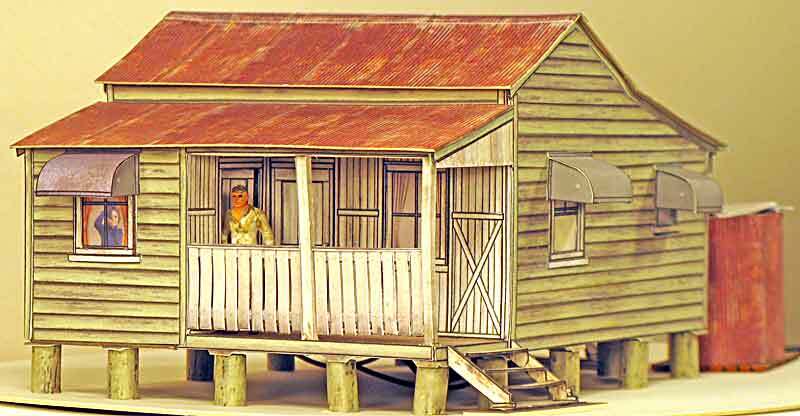 This model (right) was inspired by a Fijian navvy wagon. Mounted on a commercial On30 underframe (cast metal), it uses HO bogies (trucks) and couplers and is described in Handbook #22. Most recently (2010-2012) I've been creating models using photorealistic techniques on the computer. Essentially this means creating drawings of the item being modelled, then filling the drawings in with scaled images of the required textures (timber sheathing, metal surfaces, windows, etc.). The results are printed on card, cut out and glued together. The models can be quite complex and very realistic. . . the development process is similar to creating 3D models for virtual worlds such as TrainSIM or Trainz. A number of card model kits, both conventional and photorealistic, are available for free download. last updated: 5 March 2016.